At this moment there is no exhibition and the gallery is closed. In the stockroom you can find the art from the online gallery. The gallery is established in an old barn that goes with a more then one hundred year old farm. The foundation of the gallery was in the summer of 1988. At that moment there was a lot of ceramic art exhibited in the gallery. 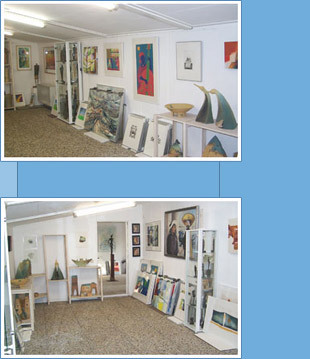 Meanwhile the gallery has expanded a few times and now there is more space for bigger paintings and spatial art. Besides that the gallery has expanded with a stockroom, where art of many artists is shown. Meanwhile the gallery was built in by a new building district. That is why the gallery is hard to find. The gallery is on a former dead end side-avenue of the Sportlaan. Now this street has been extended and there are houses around it (project de Venne). An advantage of this happening was, that in 1996 the gallery could expand with a sculpture garden, where sculptures are exhibited in the summerperiod. In the garden are old maples, oaks and holly trees that belonged to the old woodwalls. At this moment the gallery has made its name. The artists come from the Netherlands and foreign countries. Visitors come from all around the country and abroad. From Assen-highway (A28) follow the exit Beilen-Noord (131). Follow the signs Beilen and after the small roundabout you go straight ahead. Then you take the second street to the right, the Sportlaan, and then again you take the second street to the right. Here you find the street where the gallery is. From Hoogeveen (A28) take the exit Beilen (130), after that to Beilen-centrum, by the roundabout you keep the way to Hijken. The third street to the left is the Sportlaan, then take the second street to the right. Here you find the street where the gallery is situated. From Emmen or Drachten follow the signs Beilen. After the small roundabout you go straight. Then you take the second street to the right, the Sportlaan, and then again take the second street to the right. Here you find the street where the gallery is situated. The gallery is opposite a school (Beatrixschool).